Dolls which can be dressed up in the latest fashion trends - just some of the examples of what the modern-day doll looks like. So it is indeed extremely interesting to hark back to times gone by when dolls were made of very simple material such as leaves, wood, stone and so on. If you were to take a look at Native American made dolls, one of the materials that stands out is the corn husk. Corn husk dolls were one of the most popular ones when it comes to Native American culture. Corn, squash and beans were said to be the sustainers of life or three sisters in ancient Native American culture. The story is that the Creator made a doll from corn husk and this delighted the corn spirit. It was a very beautiful creation and therefore whenever she went to any village to play with children she would be praised for her beauty. Eventually, she became rather vain about herself and was warned by the Creator to mend her ways. Even though she tried, she eventually fell prey to admiring her reflection in a creek and the Creator did indeed punish the doll by asking an owl whisk away her reflection. Native American mothers remind children never to be vain by telling them the story about the corn husk doll! 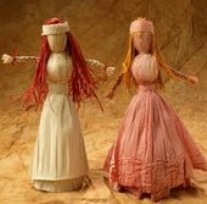 Corn husk dolls have been around for several centuries. Traditionally, Native Americans used it to entertain children as well as for religious and spiritual ceremonies. Almost every part of the corn goes into making a corn husk doll. Buckskin Native American dolls are not too large, attaining perhaps around 10 inches of height at the most. The tassels of corn were made into the dolls hair. The body shape would be made by tying the husks and then stuffing them. Clothes are fashioned out of corn husks as well. These corn husk dolls also do not have any facial features. The primary reason for this is because of the vanity of the spirit of the corn. At the most, Native Americans placed red dots to indicate the eyes of such corn husk dolls.